1. Are your dogs neutered or spayed before being adopted out? Teddy’s estimated age is two years and he was not neutered when we adopted him. Public animal shelters like the Humane Society always neuter an animal before putting it up for adoption. I was surprised that wasn’t the case for private rescue. 2. When will my dog be neutered and by whom? All of the information regarding the neuter was in the adoption contract. This private rescue organization utilizes a local veterinary technician college, and the pet owner is not allowed to interface with the vet tech college at any time during the dog’s four-day stay there. The rescue organization has until the date hand-written on the contract to arrange to have the neuter/spay done. In our case that was three months after the adoption date. 3. Why haven’t you sent me the adoption contract (in advance)? The contract was emailed to me exactly 75 minutes before our appointment, a thirty minute drive away. 4. What arrangement do you have with the high-kill shelter(s)? It was not in Teddy’s best interest or ours to wait three months, so we had Teddy neutered by our regular, licensed veterinarian. The private rescue organization is doing a very positive thing, and they are sincerely dedicated to their mission. I’ve asked around and discovered that private rescues are becoming common, and if that means more homeless dogs find forever homes, then the net result is a good thing. We love Teddy, and are happy to have him join our family. My advice to potential dog-owners considering adopting from a private rescue: ask more questions than I did. Carefully read anything hand-written on the contract after you signed it, before leaving with your new dog. Clarify all information conveyed verbally and check for consistency with the written contract. 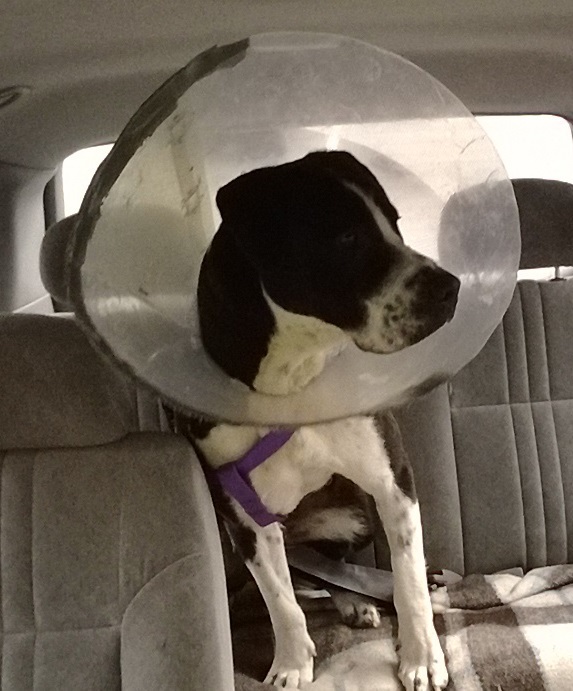 Here’s a photo of Teddy a couple days after he was neutered. If you adopted your dog from a private rescue, did everything go as expected? This entry was posted in Life and tagged dog rescue, Seattle. Bookmark the permalink.